To paraphrase Ibn Batuta “The highlands leave you speechless and then turn you into a storyteller”, and that is my only conclusion to why great novels are either conceived in Scotland or filmed in its cradle. The constraints of space, time and your attention span do not give me liberty to share the elaborate version of my travel tale in the Scottish Highlands, but I hope you gather every ounce of your imagination and find yourself there through my journey. No matter what I write to describe my experience in Scotland, it will not do justice. But since I have your private audience do take the advantage of multiplying my words a hundred times to get closer to the real experience and it won’t be an exaggeration. Why this particular tour? If you wish to live in castle hotels in Scotland we have that covered in our previous posts and all you need is a chauffeur driven car or to drive it on your own. But if you are on your maiden tour to the highlands on a girlfriend getaway or a solo traveller getaway, I would personally recommend you join an intimate bunch of adventure travellers on a trip with Highland Explorer Tours where provisions like accommodation, breakfast, entry tickets and guide are taken care of. In the 3 days away from Edinburgh not once did I miss the comfort of city life nor the pampering of a castle. On the contrary it seemed like the trip was much shorter than 3 days once the final day dawned upon us. We wanted more time to be with our new travel buddies. Highland Explorer Tours in my experience was an absolute delight to travel with. From the time I entered their office on Royal Mile in Edinburgh for the pickup to the time I was dropped back in the city every minute was seamlessly handled. The Guide: The key aspect of any guided tour is the guide and if that part is working like a well oiled engine every other part falls right where it belongs. Our merry band of 20 odd travellers was guided by Joe and he left us in splits not to mention rich with the historic knowledge of the Highlands. Joe is a highlander himself and he introduced us to his native land – a tiny island or Isle (as they call it in Gaelic) south of Skye. It was reassuring to know that a seasoned veteran from the British army was our guide and he was a highlander too. There you go we are now in safe hands let’s fire up the bus engine shall we ? Day 1 : Enroute to the Isle of Skye we drove through Fort Bridge and Perthshire as an introductory landscape of what might be ahead. Perthshire is a beautiful countryside and as we drove farther into the country the measure of nature’s beauty only rose higher. Our first stop was at this quaint little village of Dunkeld to visit a historic 12th century cathedral. What caught my eye or rather what you can’t miss is the most picture perfect spot on the banks of River Tay right outside the cathedral. This is where as mentioned earlier, words fail me to describe how serenity danced with scenery to the sound of the cathedral bells. 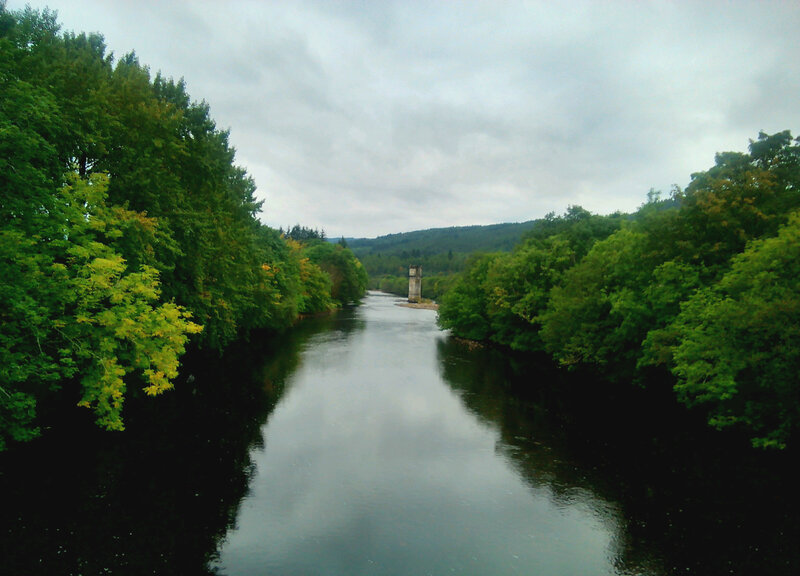 The journey from Dunkeld to Fort Augustus was another window opened to soak in the picturesque world of Highlands. Along the way Joe regaled us with his narrative on many tales from folklore and history of the land. We stopped by for a little detour to another fairytale spot this time Scottish flags in hand, ready for a photo opportunity. Our arrival to Fort Augustus was greeted by Scotland’s famous Loch Ness and the weather had just turned misty. The harbour of Loch Ness is a lovely walk that opens into the arms of the mysterious lake. You can take a ride on the cruise (maybe spot Nessie) or even have lunch on its banks after your stroll along the loch. I expected some kind of frenzy of visitors at Loch Ness but instead discovered a calming embrace by the glens surrounding the waters. It is indeed one of those dreamy spots you could get lost into. The mist and the green scenery around us soothe every nerve in the body. You have enough time on your hands at Loch Ness to soak in the environment and the beauty and I would recommend you make most of your photography skills here. With a heavy heart we bid adieu to the loch only to find it chasing us for a long distance on the way towards the Eilean Donan Castle. Before we embarked on our journey to the Isle of Skye we had a stopover at Eilean Donan Castle. One look at the castle’s exterior and you immediately recognise from the movies and shows that have filmed here. Made of Honor, Highlander have been filmed here and has some of the most popular scenes shot at the exterior and interiors. On the very first day, while driving through the highlands, we were tirelessly in a state of awe and had our eyes dilated and jaws dropped every other minute. You can imagine how persistent the country was to keep us in awe that we found it difficult to drift our minds to our camera and capture the moment. The camera no matter how sophisticated, does not come close to the beauty your eyes behold while living in the moment. In retrospect, I would bathe leisurely in the magical surroundings of Scotland as much as I can before the trip comes to conclusion. We retired for the day at Portree harbour, a popular charming village in Isle of Skye and surprisingly stacked with banks, ATMs, Asian, Indian, American restaurants, Scottish bars of course all in the center of the village. Its almost as though it was equipped for tourists and not for the locals. Portree is an ideal spot on the winged island and it was our wee village for the next two days. Day 2: I am a mountain person. How about you? If you are a mountain person you’d know that every range has a way of communicating to its minuscule size human visitors. The Himalayas are pristine, sacred, and domineering to marginalise your presence at their feet yet very welcoming. The Alps are the more gentle yet leave you mesmerised by their ethereal beauty. The Scottish Cuillens, Bens are enchanting and engulf you in their water belly and draw you into a magical world that no one has ever seen before. It is only befitting that the world’s most popular novel on the world of wizards was written and inspired by Scotland and the highlands. These ranges are magical and you can either try to fathom why or just let them enchant you without your consent. Our second day on Isle of Skye was exactly that – magical. From Old Man of Storr, Quiraing, Uig, Sligachan to meet the black and red Cuillens, watch the Kilt Rock fountain fall directly into the Atlantic ocean and fade away, we were stretching our limits of sheer joy to its seams. Joe enthralled us with the historic relevance and folklore about the locations as we drove towards them with traditional Celtic music playing in the bus all day. Not only did we see the actual film locations of Stardust, Harry Potter and Highlander but we also chanced upon a loch named after… guess who? George Clooney !! Did you know that there is a loch named after him thanks to Sean Connery, since they haven’t really named all of the 35000 lochs in Scotland. It was a lovely discovery and fun fact to learn from Joe. Before lunch, we stopped over to visit the MacDonald clan’s residence – Dunvegan Castle and heard tales of Bonnie Prince Charlie on our way there. 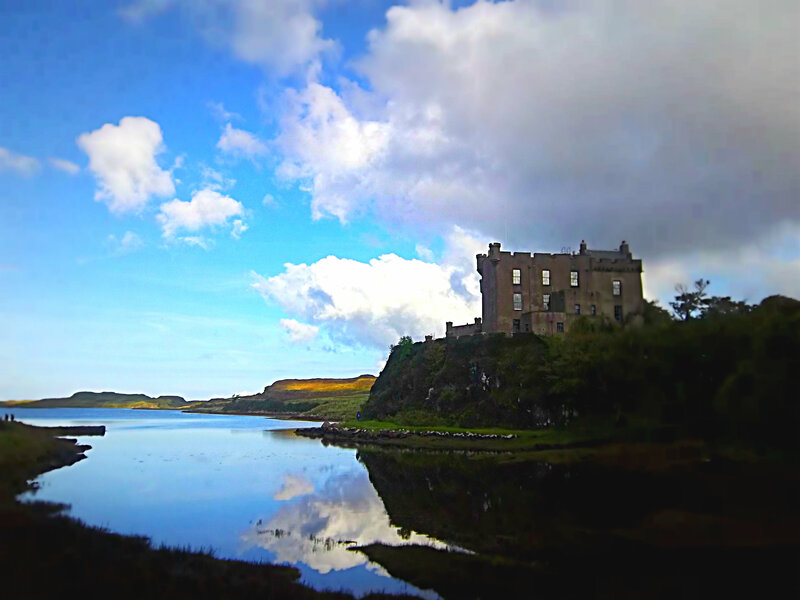 Dunvegan Castle is surely one of the most well maintained and quaint castles where history of the highlanders and the MacDonald clan offers an insight to the life and medieval times in Scotland. Joe had us off the bus for many a detours, photo stops which were all breathtaking to say the very least. He had us hike and climb steep hills and sometimes to stand atop the fairy falls, allowing us slice of the highland life. Isle of Skye is truly one of the most picture perfect destinations I have explored. Day 3: Before retiring on the previous day, Joe had promised the ‘Harry Potter fans’ in our group a treat to meet Dobby’s final resting place. Never have I witnessed such excitement to visit a fictitious grave of a fictional character as I did when he announced it. For those of you who have read and watched the last part of Deathly Hallows, know that the house elf wasn’t really buried there, it was just filmed on the beach of Loch Morar. Nevertheless we rose with a spring in our feet, for this was the day of the Hogwarts Express ride too !! At first we explored the country even further with some walking trails and photography before we headed toward Armadale a small village on the southern end of Skye. The Clan Donald visitor centre in Armadale is a stopover for a quick bite or coffee or you could take a quick walk around for some spectacular views of the loch and glens. From Armadale we boarded a ferry to Mallaig (pronounced Mallaag) which is a little fishing village outside of Skye. Mallaig has its prominence as a travellers’ destination for Loch Morar and the Jacobite Steam Train ride. Loch Morar is a calm escape away from the village and the ferries with a short strip of white sand beach on its shore. This is where the scene from Deathly Hallows was shot where the house elf Dobby was buried and as planned our group enacted the ‘paying respect to Dobby’. Hilarious as it was, it was here that we realized our tour was getting closer to the finish line and the group was suddenly seizing each moment to huddle together along the journey. When you’re having the time of your life with fellow travellers familiarity transforms into friendship very easily. 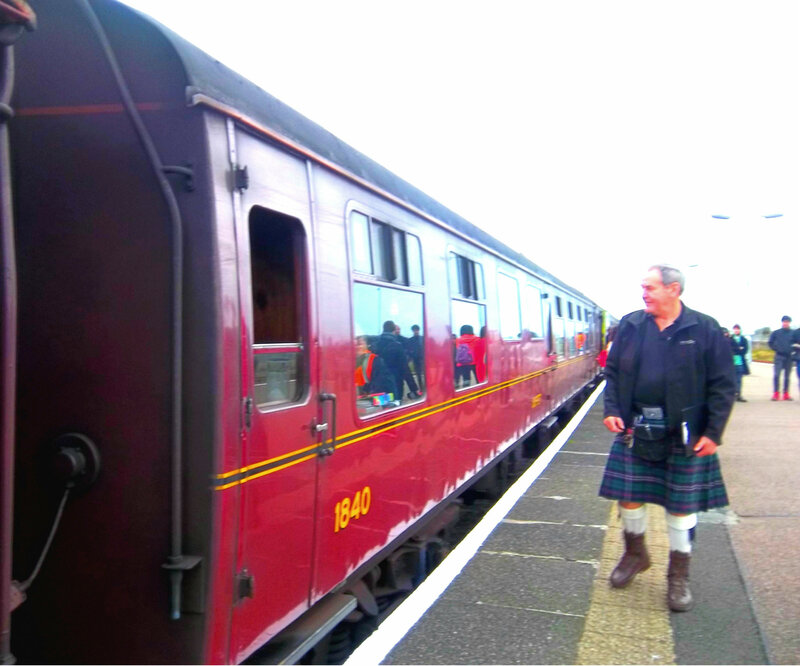 After lunch at Mallaig, we wasted no time to head straight towards the highlight of the day – Hogwarts Express journey. As we saw her standing on the tracks awaiting our arrival, I could almost experience being in Harry’s shoes when he crossed over from platform 9 3/4 and laid eyes on this black and maroon beauty. This is the same train used to film the scenes of Hogwarts Express and Joe was quick to share his tips on how to capture the perfect shot from the movie. Our bunch from followed Joe’s instructions like a manual and the product is for you to judge in the video below. On arrival at Fort William, we drove through the village to catch a glimpse of Ben Nevis and Loch Lochy. Our last stop was at Glencoe to meet the three sisters while the clouds looked threateningly down upon us. Glencoe is nonchalantly beautiful the three sisters were a wonderful sight to capture just when it started to drizzle. Until this very moment the sun was shining bright for three days which helped our highland exploration. On the way back to Edinburgh we crossed the Rob Roy country where he is buried. Closer to Sterling Castle and on the way back we caught a view of William Wallace memorial. Must do: Once the Jacobite steam train has departed, 45 minutes into the journey start walking towards the end of the train as farther down as you can. When you cross the souvenir shop on the train keep to your left until you see the door with a window open. Be careful while you stand by the door and wait for Glenfinnan station to pass. Position your camera on the photo mode and test some shots before the Viaduct of Glenfinnan approaches. You get plenty of time to get the swing of the position most suited. As you see the train chugging towards the Viaduct of Glenfinnan start shooting for the perfect capture of the train whistling over the viaduct. Everybody on board wants to get this shot and everyone aims to catch a good spot but this tip comes handy. Explore Portree it’s a cute little village with a fabulous view of Lochalsh. 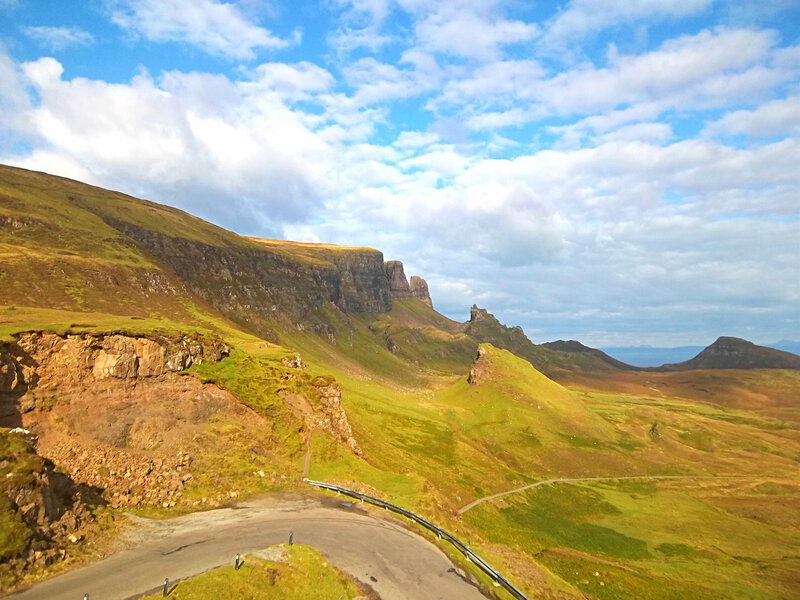 Must see: Viaduct of Glenfinnan, Quiriang, Kilt Rock at Staffin and Old Man of Storr. Remember To: Scotland is the wettest country in the UK, please do carry your rain coats and weather proof flat boots. When in highlands say goodbye to your heels ladies. The bus departs the office of Highland Explorer Tours on Royal Mile at 9.00 am and you are expected to have your luggage in the back of the bus 10 minutes before so that everyone is ready to leave on time. Since the group is intimate the bus is as well hence it makes sense to just carry one 20 inch suitcase with a medium handbag with you. To plan your tour in the Highlands please visit Highland Explorer Tours.